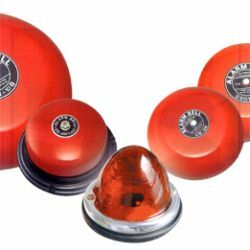 Camsco’s alarm bells and fire alarm bells are designed and manufactured according to UL standard, and voltage according to customer’s request. CAMSCO's fire alarm bells are traditionally used for businesses, so our fire alarm bells are designed must have an alarm that is loud enough to be heard. To design and manufacture according to UL standard. Voltage according to customer’s request. Take the back plate off the bell and connect these wires to the terminal. Plug these connectors into terminals.